Metodología Flipped para mejorar el aprendizaje de idiomas. INTEMIS (Método de enseñanza innovador para una escuela inclusiva) es un proyecto Erasmus+ destinado a introducir en las escuelas y en centros de Formación Profesional, el aprendizaje basado en las TICs y en la metodología flipped con un enfoque pedagógico innovador y centrado en el alumnado. El objetivo del proyecto INTEMIS es capacitar al profesorado para que utilicen las estrategias de enseñanza más innovadoras para mejorar la educación y la formación profesional a través del aprendizaje invertido o metodología Flipped. El pasado octubre, Inercia Digital organizó una actividad formativa para el proyecto INTEMIS, en El Rompido (Huelva), para que los participantes mejorarán sus competencias digitales. Si quieres más info sobre la acción formativa aquí . 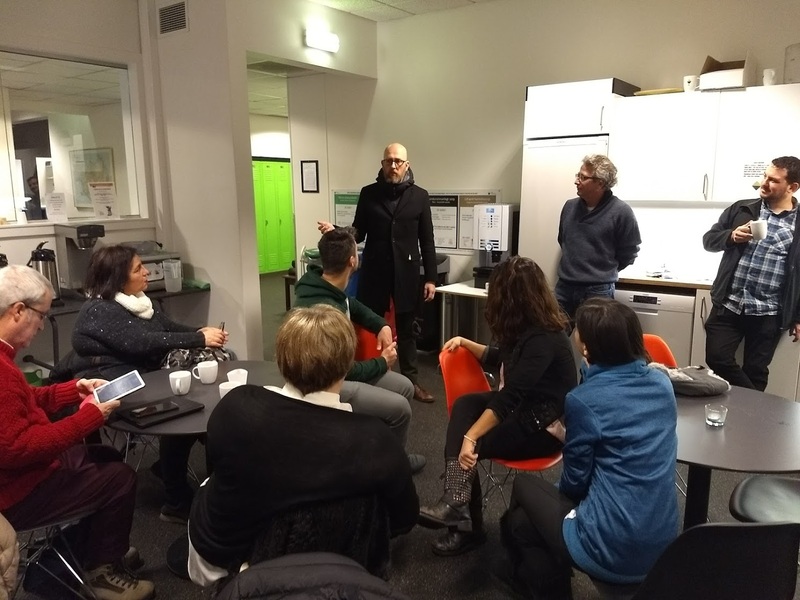 La tercera reunión transnacional de InTeMIS ha tenido lugar en Reykjavík, Islandia, y fue organizada por Keilir – Miðstöð vísinda, fræða og atvinnulífs. ¡Nos gustaría agradecer a nuestros anfitriones por su bienvenida y gran hospitalidad, así como felicitar al coordinador del proyecto de Italia, el Istituto d’Istruzione Superiore Leonardo da Vinci, y a todos los socios por el buen trabajo realizado! Si desea obtener más información sobre el proyecto InTeMIS, puede visitar el sitio web oficial de nuestro proyecto o solicitar ser miembro de nuestro grupo de Facebook. INTEMIS (INnovative TEaching Method for an Inclusive School) is a Erasmus+ project aimed at introducing in Schools and VET Center, ICT based Flipped Learning, an innovative and student-centred pedagogical approach. The aim of INTEMIS is to train VET teachers to use the most innovative teaching strategies to improve education and vocational training through in-apprenticeship. “The pedagogical methodology Flipped Classroom leaves the traditional magisterial classroom (teacher-blackboard) and uses the advantages of ICTs in order to focus the learning process on the student. This kind of methodology suggests that some learning processes may be fulfilled out of the classroom, something similar to the homework proposed by teachers. The difference lies in the sense that this homework revolve around reading (articles, blogs, files, websites), listening (podcast) or watching (audiovisual means, images, computer graphics) the educational goal, either individually or in a collaborative way with the rest of classmates via online or cloud-based, but always under their teacher’s supervision and from their houses before the next class (on site or virtually). This allows students to have a previous knowledge before attending to class. In such a way, the superior way of thinking (analyze, assess ad create) develops while students are taking classes, seizing the practical knowledge obtained previously. Thus, students discuss and share their ideas by consolidating their understandings sustained by new technologies. In addition, they are always assisted and supervised by their teacher”. Last October, Inercia Digital organised a training activity in El Rompido (Huelva) aimed to improve the participants’ digital skills. Click here for more info regarding the training in Spain. The third transnational meeting of InTeMIS took place in Reykjavík, Iceland and was hosted by Keilir – Miðstöð vísinda, fræða og atvinnulífs. We would like to thank our hosts for their welcome and great hospitality. Moreover, we would like to congratulate the Italian coordinator from Istituto d’Istruzione Superiore Leonardo da Vinci and the rest of the partners for the great work done! If you wish to learn more about InTeMIS, please visit the official website of our project. You can also request to become a member on our Facebook group. This entry was posted in Erasmus+, Innovación, Proyectos Europeos and tagged Flipped, Formación, Innovación, intemis, Proyectos Europeos, TIC. Bookmark the permalink.